The anger of the protestors who blockaded a Google bus in the Mission on Monday was very real and understandable. San Francisco residents, living in a highly sought-after city with a limited housing supply, are coping with a crisis of skyrocketing rents and evictions. Meanwhile, Muni riders increasingly find their stops blocked by private shuttles that appear to be whisking away the very Peninsula tech workers blamed for driving up rents. Plenty has been written about the strife caused by SF’s housing crisis in the last few years. But as we wrote in February, pointing fingers at tech shuttles doesn’t help solve the problem — if anything, it’s a distraction from effective solutions. The real culprits are the decades-long failures of SF and other Bay Area cities to develop efficient transit systems and the kind of walkable neighborhoods that are in ever higher demand, yet in scarce supply in the region. And deeper than that is the cultural aversion to change and the political establishment that caters to it, avoiding tough but necessary decisions. 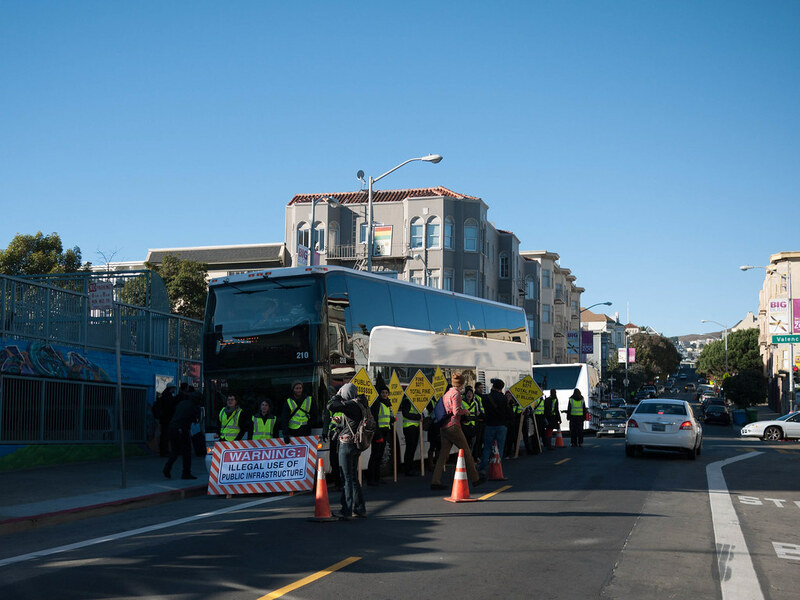 Don’t get me wrong — the fact that private shuttles are illegally using Muni stops without paying anything for it is unjust and unsustainable, as Monday’s protestors rightly called out. But those specific problems can be addressed by devoting more curb space to transit — both public and private — the vast majority of which is currently devoted to free, subsidized personal car storage. The SFMTA’s plans to convert car parking to shuttle stops and establish a private shuttle fee system are a step in the right direction. But what’s really hampering Muni performance is all the private car traffic that bogs down buses and the unnecessary frequency of stops. Imagine if protestors devoted this much energy and media savvy to demanding speedy implementation of the Transit Effectiveness Project by City Hall. Meanwhile, the fact is that the Bay Area can’t have the dynamic tech-based economy sought by Mayor Ed Lee and an affordable housing supply for middle-class and low-income people without building substantial amounts of walkable development. One factor we’ve pointed out on Streetsblog is that housing development in SF and other cities is hamstrung by minimum parking requirements, meaning housing for people is mandated to come with a certain amount of housing for cars. This adds to the cost of building, owning, and renting that housing, and limits the amount of space for residences or businesses. And as research has shown repeatedly, when housing is bundled with a parking space, residents are more likely to own a car and drive, making the transit system less effective. Unfortunately, the positions staked out by Supervisors David Campos and Malia Cohen on recent housing development projects coming out of the Eastern Neighborhoods Plan work against the goal of affordability. Campos and Cohen have fought projects on the basis that they don’t have enough parking, causing developers to add spaces or subtract apartments, flying in the face of smart zoning policies developed over ten years. Meanwhile, parking-free housing is a growing trend in other American cities. Plan Bay Area is a start on smarter housing development — it lays out how cities can accommodate population growth around transit hubs like Caltrain and BART stations, minimizing the need to drive and keeping the costs of housing and transportation low. Rising rents spurred new development, which has halted the rise in most areas and slowed it in particularly high-demand parts of town. Nearly all of this growth has been along the region’s Metrorail subway system, too, so rising population has not equated to rising traffic. And, importantly for keeping urban character alive, quite a bit of this growth has occurred outside the city core, often in new urban centers in what were suburban strip-mall landscapes. To San Francisco, this has been the equivalent of tens of thousands of new housing units along the East Bay BART lines and Caltrain, and the virtual elimination of the urban strip mall. That’s not to say DC has been immune to displacement. The once-burned-out H Street NE corridor gentrified quickly, as has Hispanic Columbia Heights. African-American Petworth and Brookland are coming under pressure from well-heeled renters, too. But the thousands of units in the suburbs and in the city’s center have given these areas time to prepare. Affordable housing, inclusionary zoning, and various direct legislative efforts to keep people in their homes can be attempted, improved, and applied to neighborhoods that have yet to be overwhelmed. Areas without any pressure, armed with these protections, are starting to wonder when their day will come. In the near term, residents can only do so much to fight the crisis of evictions and insane rents, and it’s frustrating. I’m experiencing this myself — my fiancée and I are fortunate enough to not be at risk of eviction, but we feel trapped in our small studio. Scapegoating private transit that fills the gaps in the public transit system — perhaps the most visible symbol of change — is easy, but it’s counterproductive. The bottom line is that San Francisco needs to make the tough political decisions to prioritize people and transit, not cars. Cities up and down the Peninsula and the East Bay need to ditch the suburban model of the 20th century and embrace the creation of more human-scale, transit-friendly neighborhoods that more of us want so badly to live in. 3 miles is an eternity in transit miles. It also requires a change in mode share. Bare minimum that is 15-20 minutes, minus waiting time. But more importantly, many of those job centers have terrible connecting transit. Buses that run once and hour or only for commutes are useless. And if you have no access to lunch or other basic errands in walking distance/frequent transit access distance it doesn’t matter. Things like bike sharing can help bridge the gap, but you also need other amenities in those 3 miles. There’s a reason Google’s employees don’t want to live in Mountain View. Google needs to step up and convince Silicon Valley to urbanize. Both things may be true. When you see financial analysis showing that new housing won’t cover its costs for schools and other services, it suggests that the issue is on the residential side in addition to commercial. mode share. Bare minimum that is 15-20 minutes, minus waiting time. importing highly-paid mostly young men, who naturally want to live where the women are. Commercial properties don’t turn over in ownership as frequently as residential properties. It’s more nefarious than that. If I sell you a building, the property gets re-assessed. If I sell you a part of my company, which includes a commercial building, there is no transfer of real estate, and no re-assessment. I think you would see a lot of negative reaction to the idea that public money is being spent on transporting workers from a few rich companies from their homes in San Francisco to their jobs on the Peninsula. Exactly what happened in Palo Alto. When I was fighting for high-speed rail in Palo Alto, I was typically the only person under 40 who showed up to Council meetings. I really don’t think “the techies” are in SF for the $4 toast. I was a techie in Silicon Valley who moved to the City. The simple incentive for me was that a college roommate who is not a techie got a job in SF and I moved in with him. The other incentive was that due to a more balanced set of industries, the gender disparity amongst single people on the peninsula does not exist in SF. Once I got married, my wife likes SF and she could get more work in SF, but I would have been equally happy near more cycling and hiking, better weather, on the Peninsula, and many of the downtowns have restaurants I consider equally interesting. If you live near one of those downtowns… it’s easier to go from Palo Alto to San Mateo on Caltrain than it is from Noe Valley to North Beach on MUNI. There isn’t enough live music for my taste, but we have a kid now and couldn’t go close the bars if we wanted to. If you want to attract “the techies” to the Peninsula, it has to start with grade school education for Women in Math and Science, or the Peninsula would have to attract more industries without the gender disparity. Bike share + dedicated bike infrastructure so people feel safe. “Urbanize” as in build communities that have dense, mixed-use, walkable neighborhoods. Pretty much the aspects that attract people to SF. Everything on the Peninsula is so far apart that everyone has to drive, which means everyone’s trapped in their own little bubble so there’s hardly any culture. I’d also point out that public education is one of the things that many cities on the Peninsula have gotten right, or at least more right than SF. There’s families that pay $700/month to live in a goddamn trailer in Palo Alto just so their kids can attend better schools! As I replied to Jame, it appears that most jobs are close to the major trunk lines of BART and Caltrain. So I’d say it really is mostly a housing problem (thanks Prop 13, etc) plus a failure of regional transit agencies to solve that last mile-or-three problem. Then also we have the feeble rollout of BABS to show us that not enough brainpower’s behind solving said last-mile problem. “Everything on the Peninsula is so far apart that everyone has to drive”. That is an exaggeration depending on where you are. Mountain View, Palo Alto, Redwood City, San Mateo have walkable downtown areas. If you use a bicycle, the less sprawly areas have everything you need for daily life in short cycling distance. Santa Clara is not the whole place. Right, “walkable downtown areas,” AKA a few urbanized areas scattered here and there. But that’s a tiny percentage of the overall area. How walkable is 38th and Noriega? How walkable is Burnett? Dalewood? Seacliff? Forest Hill? That’s a great point about 3 mi radius. Why these cities aren’t pushing for protected bike lanes instead of shuttles…? Both/and. Also they are. RWC has some in the works. MV is talking cycle track on Shoreline. Palo Alto is working on bicycle boulevards. They could be more strategic about it. I suspect cities managing mode share will help them focus. A hell of a lot more walkable than your average street in, say, Menlo Park. I lived in PA, Hawthorne and Alma. Walked to downtown Menlo all the time. Ped/bike path to Menlo Alma, walk down to BBC, Oasis, downtown. QED. Get drunk, Caltrain back home. The Alameda section has good access to Sharon Heights. Stanford is right there with a ton of recreational opportunities. All of it is a hell of a lot more bikeable than anything West of Castro Street. In PA you have at least 3 “downtown areas”, in addition to University there is Cal Ave and Middlefield, and a lot of quiet streets have easy access to Town and Country. I was riding down Bryant one morning at 7:30 AM. I saw more kids biking to school that day than I have seen doing the same in SF in 15 years. Come on, really? N = ? There are a lot of Peninsula/South Bay workers with families here. A lot. People are putting down roots here because it’s easier to change jobs with more transit options; or perhaps their spouses are working elsewhere and transit out of SF is easier to two disparate places. Even more importantly, many are here because they know they’ll be splintering off in the near future and working for or even founding a startup here. Please read Enrico Moretti’s “The New Geography of Jobs” and think about how many jobs cluster around workers like these. They live here, consume services, educate their kids, and, perhaps, create new jobs later on. A much more fruitful way of thinking than Rebecca Solnit’s whiny hate-filled screed about why techies are ruining her house hunt. keyword I used: anecdotally. Geez, didn’t realize the nerves were so tender. There are also a lot of tech workers who don’t have roots here and don’t seem very interested in putting down roots and are here because their other college buddies are here and so is some delicious food, drinks, parties, friends, hackathons etc. A lot. N= ? Your characterization of Solnit shows that you’ve never really read her work. Although I haven’t read moretti’s The New Geography of Jobs, I have read his bildungsroman book, not that it’s particularly helpful here. There were plenty of housing available in the past given the vast suburbanization in the East Bay and infrastructure like BART (yet their workers didn’t get the same transportation subsidy that Googlers have). While you can still buy houses in Elk Grove or Stockton and take ACE (the service and experience is far inferior than living in Walnut Creek and take BART in the 1970s), taste for younger folks has changed and the cities (mostly governed by the baby boomers) attitude hasn’t changed so much. My point is that cities shouldn’t just plan for the jobs without housing. The problem with the shuttle is that with the money those employees saved by not spending on commuting, they drive up housing cost. If these employees have to pay their own way (whether it is a car or regular transit), they might have not driven the rent that high as some of the folks may want to live elsewhere where the actual commuting cost is lower. If these companies want to have a massive corporate campus in SF, then SF would have the ability to plan and manage that, including the housing element. But when they can build somewhere else where they can get easy approval, they can use shuttle buses to dump their problem and where SF cannot plan or control. Think about it, if one city bans oil refineries because of pollution problem, an oil company could open it in the next town where the city wants the jobs, but the air pollution still travels to the city where it is banned. But that’s communism. Haven’t you heard of Agenda 21? @murph — did you forget we’re talking about San Francisco? Well that was a hard one to google! Never seen s/ whatever before, but I think you’re saying you meant to say Public Transportation instead of “MUNI [sic]”? Sorry for being punkish, but I sort of meant it legitimately. ie., what transit service needs to be better in order to avoid a Google Bus? You can get to Google via transit today. In fact, I just visited yesterday via Caltrain and a shuttle. Seemed to take less time than the Google Bus, but it wasn’t free and to my door, so.. yeah. Good luck competing with that. But go ahead and use our public space for your private needs, Google, kthxbai. That’s great, but you have to admit it’s not the norm to not drive in the south bay. What percentage of households have no car? What percentage of “techies” live in 38th and Noriega? Burnett? Dalewood? Forest Hill? I see you are not a techie nor a philosopher. The original post was a logical fallacy. If our public transit is bad – that is the fault of our government, not Google. The buses might be a syndrome, but their existence is not the cause of bad public transport. A Caltrain pass to MV is $180 a month, $100 or so roughly after the tax deduction. The rent on our last SF home has gone up $2000 a month in 5 years. Contrary to traditional beliefs, transit can induce demand. Traditional American thinking is that if someone can drive along the corridor, any transit that you add is just simply converting modes from people who otherwise drive. The reality is that availability of transit can induce travel demand from people who otherwise won’t consider traveling, driving or not. During the BART strike, a lot of people decided not to travel, or otherwise the congestion would’ve been worse. Those company shuttles not only providing a financial subsidy, but also time savings. People can do the same journey on Muni+Caltrain+shuttle but for longer travel time and more hassle. So for some of the shuttle riders, without the shuttle, they might consider living in Fremont or San Jose, rather than driving to/from SF or take Caltrain. Expansion of traditional transit can induce demand as well, but the development around transit can be planned and managed, like increasing housing density along a rail line. But the massive growth of those shuttles are not planned, and unlike regular transit, low income folks (or anyone who is not the company’s employee) are not able to get any direct benefits by using it. I know most of those operators would be thrilled to have Golden Gate Transit’s contract, which charges $139 per bus revenue hour rather than the more typical $89. Even though bike lanes should be there, it is unrealistic to expect that a large portion (say, anything above 1/4) of the workforce of a given company will just engage in a physically exhaustive activity just to get to work. Do you just copy paste responses? Not to mention, the ride is COMPLETELY flat. It probably takes less effort to bike Caltrain to GOOG than to walk from their car at the far reaches of the parking lot to their desk. Riding a bike 3 miles is physically exhausting? This country is completely soft. We deserve our impending collapse. Exactly, you can walk when you get there. But most people don’t live in walking distance of these walkable areas. So basically they are driving to walk around. Much different that actually being in walking distance of something to walk to. This is true BUT — this was “many years ago,” and is not applicable today given cultural shifts. Back then: not unusual to work for the same employer for most of your working life, not unusual to have single-income families, and private car ownership was very limited compared to private car ownership today. This meant that you *had* to live close to work, or close to a trolley or train line. Today (at least in the Bay Area): It is extremely unlikely that you will work for the same employer for most or all of your career. And many families are double income, and car ownership is ubiquitous. Let’s pretend for a second that companies were still providing housing for their employees today. What happens when someone wants to change jobs? What happens when someone in SF gets a life partner who has a job in Fremont? What happens when someone starts a family and wants to live in a specific school district, but then wants to change jobs? If housing and employment are tightly coupled, you have considerably less flexibility in terms of where you work and where you live. Maybe this would actually be a good thing — maybe we wouldn’t have so much sprawl/congestion/pollution if this were the case — but that’s not my point. My point is that the norm in the early 1900s no longer valid today. Geez, I’m talking of some middle ground here. Cycling can be made attractive for more than 1% of the population, but that isn’t to say that people should be confronted with the choice of being forced to use a specific mode of transportation instead of any other (in this case, “forcing” the geeks to cycle sounds almost like a “that is the price you must pay because Google is not close to Caltrain station”). What about creating proper separated bike paths between major employment centers to Caltrain stations (not these lame sharrows, but truly segregated quality bike paths or at least physically protected lanes 5 feet away from fast traffic and safe from any opening door) and then offer cycling as an alternative that many would pick, instead of lambasting Google employees who might still opt for ride corporate shuttles, drive or else. I’m all for high-quality cycling infrastructure, but opposed to “mandated-if-fit cycling”. People should still have driving and motorized public transportation good options if they don’t WANT to cycle. From Caltrain to Google there is not one but TWO completely separated, grade separated, class I bike path, along a quiet creek. Of course, you knew that, right? I didn’t, but if that is the case, then the problem is that people don’t want to cycle to Google because their previous commute to Caltrain MV station is bad. Get a clue. Planning here happens by the whim of citizens with time to show up to meetings, and by politician intrigue. There is no central planning in 2013 San Francisco. And what a shock that Scott ‘Darth’ Wiener’s reposting of this turned into another ad for his property developer bosses. How about requiring all new development to actually include actual BMR units, rather than letting developers buy their way out of it by paying the City (has anyone seen where this money is going?) or building them off site in crap neighbourhoods? How about paying the people doing the grunt work in the City a real living wage so they can afford to actually live in the city they clean, build and service? How about a moratorium on evictions and the Ellis Act to stop the rampant speculation? Agreed, we do need more housing. But there are ways to achieve it without betraying the City’s soul. What Drives the Google Bus?